Run by Neven Maguire, award-winning MacNean House & Restaurant caters to the vegetarian as carefully as to the meat-eater. Enjoy. There’s a certain, timeless grace to Florence Court: soft, sandstone pillars arch gently down either side of this Palladian mansion, stretching like arms out to its verdant gardens, leafy forest trails and welcoming visitor centre. Follow the path to the Florence Court Yew, thought to be the parent tree of all Irish yews, and drink in 300 years of pomp, poise and pristine elegance. Hungry? The Tully Mill Restaurant on the estate will fill you up. 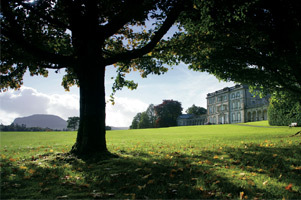 Pop into Crom Estate on Upper Lough Erne, where the Earls of Erne have sat for almost four centuries. Ok, maybe not a million – but this IS one of no fewer than 154 islands on the River Erne! A monastery was established here back in the 6th century, before being raided by the Vikings and later burned. Thankfully, the oratory of St Molaise and the 12th-century Round Tower survived and a short ferry trip across the water from the mainland transports you to this tiny patch of rock and a medley of artefacts that paint a faithful record of the island’s monastic past. 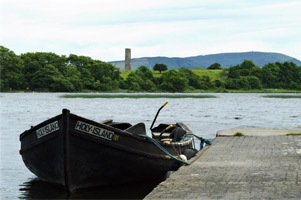 Take a boat trip to see Devenish from the still Erne waters. 500 years after Tully Castle was burned down during the 1641 Rebellion, its four walls reach defiantly above its manicured gardens into the sky. 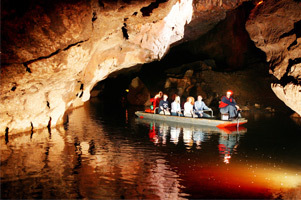 Or stick around a while for a night under the stars in the Bubble Domes at Finn Lough. Ever wondered what beauty meant in medieval times? Boa Island might have the answers: the two mysterious anthropomorphic statues of Caldragh graveyard have three faces between them and despite being 1,500 years old, they’re aging pretty well! While the statues are thought to portray Celtic deities, the island itself is named for Badhbh (pronounced ‘Bive’), the ancient goddess of war. Keep an eye out for crows and wolves while you’re here – Badhbh was said to take the form of both. 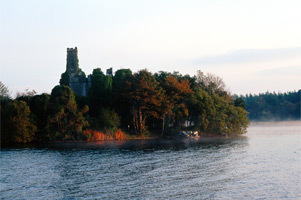 Take a quick ferry trip across a narrow stretch of Lower Lough Erne to Lusty Beg Island for a unique dining experience at its famous restaurant. 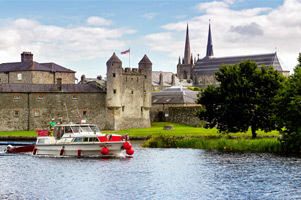 Right on the banks of the River Erne, the turreted Enniskillen Castle has that certain air of chocolate-box sweetness – until you realise that its history is scarred by decades of battle, siege, capture and recapture between local clans and the English. Inside, Enniskillen Castle Museums tell the whole story, from the Maguire Chieftains right up to the Great Famine, the Plantation and the Second World War. Fascinating. 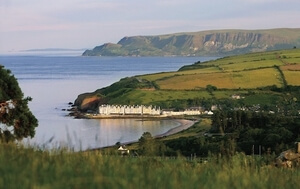 Feast on Head Chef Noel McMeel’s fine food at The Catalina Restaurant in the Lough Erne Resort. Deep within St Hugh’s Holy Well and Sweathouse, the water runs orange – a mysterious miracle, or simply an iron-rich water source? All we know for sure is that this spot was the original restorative spa over three millennia ago. Though now crumbling, the originally cosy, cave-like structure of the Sweathouse trapped the heat of its occupants and the mineral-rich water, creating a sauna right here in the Leitrim countryside on the banks of Lough Allen. If you prefer your water without rainbow hues, try a spot of angling in nearby Drumshanbo (pictured, image ©Oliver Dixon) on the craggy shores of Lough Allen and fish your worries away. One of 32 islands on Lough Key, Castle Island is that bit special because – you guessed it – it’s home to the hulking figure of an 18th-century folly that dominates the tiny island’s skyline. 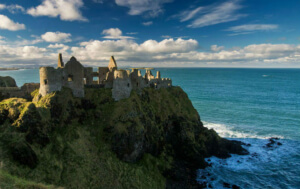 Named McDermott’s Castle in honour of a local King who lived on the island in the 1100s, this hidden gem is well worth hiring a boat on the mainland for a trip out to explore. Treat yourself to a slap-up meal at the AA Rosette Award Winning Douglas Hyde Restaurant in Roscommon’s Kilronan Castle Estate & Spa. 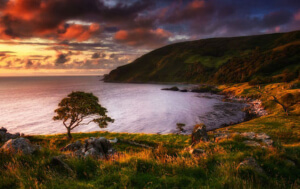 Towering oak, beech and red cedars; wood anemone and yellow iris scattering the forest floor; fallow deer stepping carefully through the branches – this is a cornucopia of Ireland’s most breathtaking wildlife. 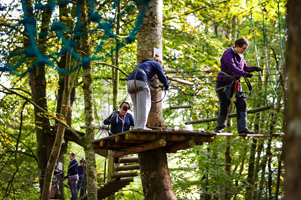 Once you’ve had your fill of the local flora and fauna, try out the park’s manmade treats: a 47-room puzzle trail, over 100km of walking and cycling trails, a woodland Segway tour – and the only Tree Canopy Walk in Ireland. Keep an eye out for the souterrain and fairy bridge, too! To warm up? Have a hearty lunch at the Lakeside Café. 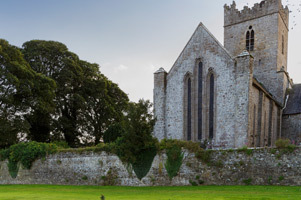 Check out Boyle Abbey: the silent, almost ghostly ruin would be unrecognisable to the flourishing monastic orders that dwelt here in the 12th century. Twinned towns, pristine castles and a positively ancient watering hole lie ahead on your trip around Lough Ree! 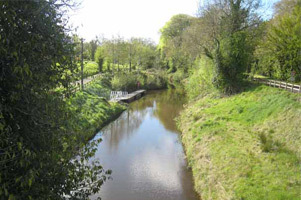 Straddling the Shannon River, the towns of Ballyleague and Lanesborough are separated by a bridge and two counties, the former in Roscommon, the latter in Longford. 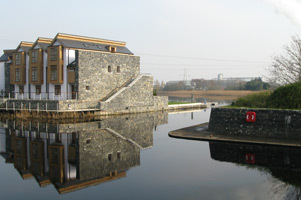 Like twins with separate identities, there’s a charm to how these towns have grown together while carving out their own specialities: Ballyleague is the perfect stop for a spot of angling, while Lanesborough is home to the beautiful 19th-century St John’s Church and was the first ever crossing point on the River Shannon north of Athlone. Rathcline Castle has certainly seen better days, but is worth a quick stop to wonder how such a colossal structure was constructed back in the 800s! On the shores of Lough Ree's 90 acres of ancient woodland, an excitable chirping echoes all around: the cheery welcome of Culnagore’s resident colony of garden warblers, a small, secretive bird rarely found in Ireland. You get the sense that time has forgotten this place… making it the perfect spot for a picnic! Take the time to plan ahead, fill a basket with fine, local produce from the Longford Farmers’ Market (open Fridays 9.30am-2pm) and feast to your heart’s content. 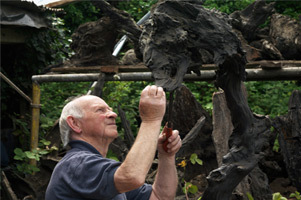 Head to nearby Casey’s Bogwood Sculptures (pictured), where father-and-son duo, Michael and Kevin Casey, create sculptures from the dark peat of the Longford boglands. The Corlea Trackway, Europe’s largest Iron Age oak road, has existed since 148 BC – and 18 perfectly preserved metres of it are on display in the Longford Visitor Centre. Built in 1210 to defend the crossing point on the River Shannon, Athlone Castle still gives the impression that it could withstand a siege or two! 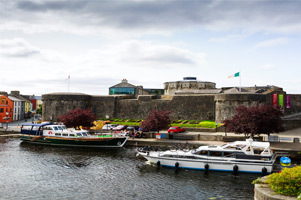 This fortified stone giant has remained at the heart of the town’s history for almost a millennium, today housing a Visitor Centre that explores the Siege of Athlone, the town’s military past and countless ancient artefacts. Savour a pint at Athlone’s Seán's Bar: tracing its roots to the year 900! Or reserve a spot at The Fatted Calf for its seasonal Beef Club night and see why it’s the pride of Westmeath. Saints, scholars and High Kings: they may conjure up ethereal images of a distant past, but this rich history is alive and well on the shores of Lough Derg. During the dark and dreary trials of the 19th century, the workhouse was an unfortunate fixture on Ireland’s landscape, the last resort for thousands of people whose lives and livelihoods had been ravaged by the Great Famine. 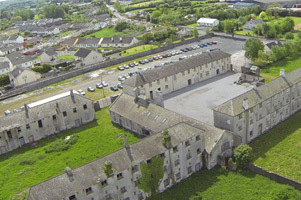 Stop a while in the Galway town of Portumna, walk through the same doors as the “inmates” did in the 1800s and explore this sad part of history through the Centre’s seven preserved buildings. Not far from airy Portumna Forest, magnificent Portumna Castle sits in stately elegance on the shores of Lough Derg. At almost 400 years old, it’s looking pretty good! The name says it all: transformed into a monastery by St Caimin in the 6th century, Holy Island in Clare remains a site of religious significance today. 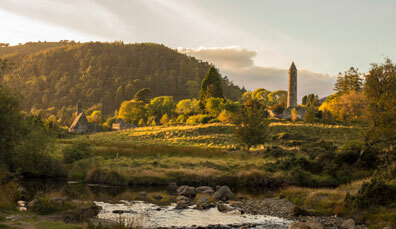 Couples come from around the world to renew marriage vows at the Bargaining Stone, or simply to explore the round tower, holy well and ancient churches – one built by legendary Irish king, Brian Boru, whose brother was once the monastery’s abbot. 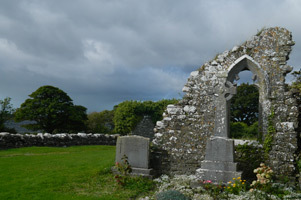 The island’s name in Irish, “Inis Cealtra” means “island of the burials”; step inside the Saints’ Graveyard and you’ll soon see why. 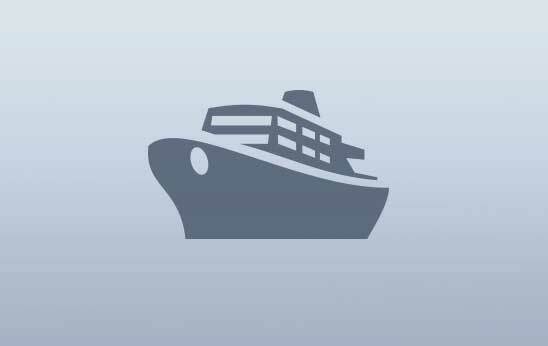 Leave the car behind in favour of Killaloe River Cruises and cruise down the Shannon, taking in the sights of County Tipperary on one side and County Clare on the other. Linked to nearby Ballina by a splendid 13-arch bridge, Killaloe is a traditional Irish Heritage Town: friendly, proud and historically rich. Brian Boru, High King of Ireland, was born here in the 11th century and his many descendants – he had at least three wives, six sons and three daughters – built many of the town’s churches, including St Flannan’s Cathedral. 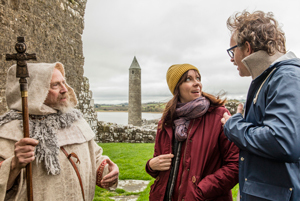 Boru’s ferocious legacy includes fighting the infamous Battle of Clontarf at age 88, so it’s no wonder he has gone down in history as one of Ireland’s most iconic figures. The crenellated tip of Nenagh Castle towers above the town, a limestone giant that seems utterly at odds with the modest, modern bungalows that sit at its feet. 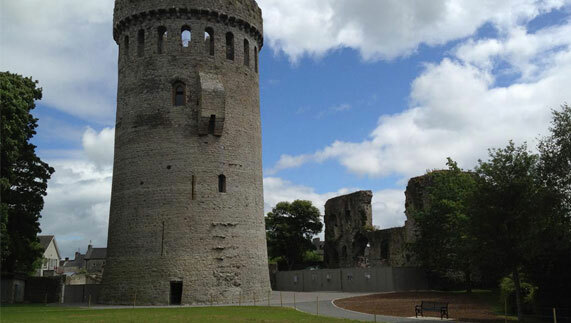 Visitors can scurry up the 101 steps of the castle’s spiral staircase and enjoy unobstructed views of Nenagh and County Tipperary. Built in 1200, the castle was once partially blown up by a disgruntled local, Soloman Newsome, who became irritated by the birds nesting in the tower’s ivy. Thankfully, it has been carefully restored in recent years! 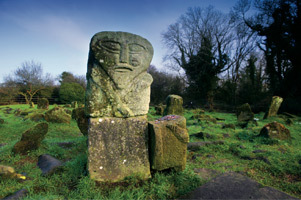 Come and explore Ireland’s Ancient East – and wander through 5,000 years of history. 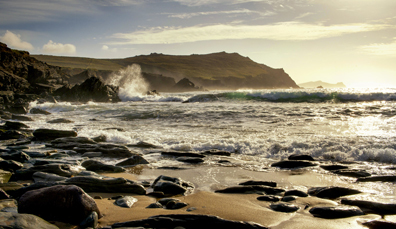 Wrap yourself in the wilderness of the west coast of Ireland on the world's longest defined coastal touring route. 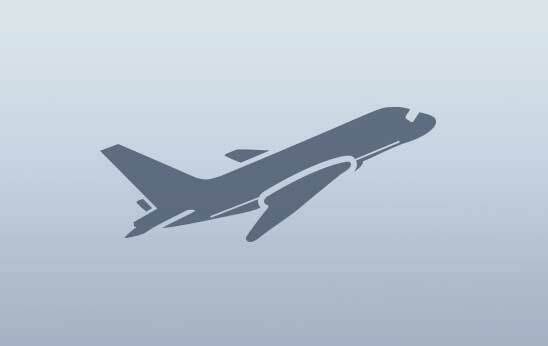 Welcome to a land of fantastical landscapes, warm welcomes, dramatic history and enduring legend. Think you can't do Dublin and Belfast in one day? 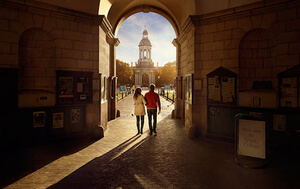 Ireland's capital cities are closer than you think. 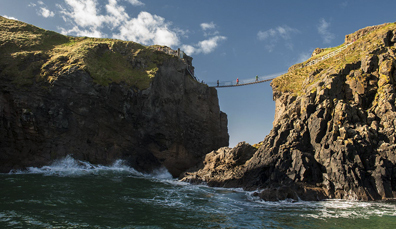 Think you can't see the best of Dublin and Belfast in one city break? Think again.